A book rest holds sheets of paper, each sheet has black ink and blue and yellow watercolor lettering. Pulled away slowly, each sheet shares the preview schedule. Sheet 1: A Marabou Preview, Week of Jan 7th. Sheet 2: “An Uncomfortable Museum Tour with Alice Procter” Tuesday @aliceaprocter. 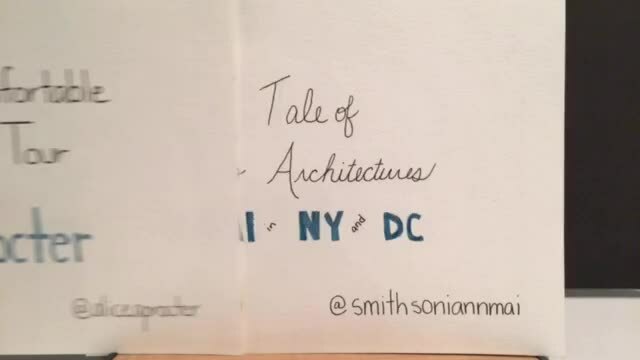 Sheet 3: “A Tale of Two Architectures: NMAI in NY and DC” Thursday, @smithsoniannmai. At the end Marabou peeks out from behind the book rest, then disappears.